Here is a list of some of our favorite books that focus on eating healthy! Have you ever heard that Monsters Don’t Eat Broccoli? Or A Fruit is a Suitcase for Seeds? Or how to Eat the Alphabet? Maine SNAP-Ed Nutrition Educators have over 60 nutrition-related read-aloud books to help students across the state learn healthy eating habits. The read-aloud books tell stories about food that are fun and engaging. Some are fictional stories featuring cartoon characters that have a funny ending and some are more factual with vivid pictures and descriptions of foods. Reading books with your children is not only a nice way to relax at the end of the day, but it carves out time to connect with your children. Stories help children develop new ideas, spark their imagination, and fuel positive habits. Books help parents, caregivers, and teachers reinforce positive health messages at home and in schools. In celebration of School Library Month, the Maine SNAP-Ed team from across the state would like to share some of our favorite books on healthy eating. Be sure to check them out at your local library. 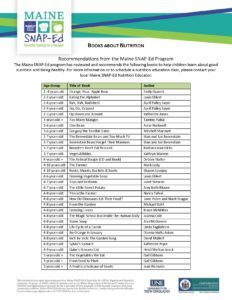 Not sure where your local librMaine SNAP-Ed Book Listary is? Feed free to reach out to the State of Maine Library to help find the public library that is closest to you. Leslie is a born and raised Mainer. Spending most summers with her Memere (grandmother) she found her passion for food and cooking. Her dream of becoming a pastry chef is still alive and in the meantime spends most of her days talking about healthy food and her weekends baking up a storm! Her favorite foods are kale and cookies, with pickled beets coming in third.